Embattled Capel Developments has seen its Sandford Lodge apartment complex go on the market in September 2012, at the behest of receivers acting for Bank of Scotland. The 109 apartments are reportedly all rented generating €2.1m per annum and the property had an asking price of €26m. This evening, sources are claiming that a sale has been agreed at €27m, representing a 7.5% initial yield, after eight bidders pursued the property. The buyer is understood to be Californian investor Kennedy Wilson which has made a major foray into Irish property in 2012 with the purchase of the 210-apartment Allianz building just off of Barrow Street in south Dublin Docklands for about €40, Brooklawn House in Ballsbridge for €15m – Kennedy Wilson’s contribution was €7.5m as it purchased in a 50:50 joint venture – on and the purchase of €360m of Lloyds/BoSI loans acquired in a joint venture with Deutsche Bank. Capel Developments is a NAMA developer as well as having exposure to non-NAMA banks and NAMA has taken foreclosure action against it and its directors personally. At time of writing this evening, neither Kennedy Wilson nor receiver Kieran Wallace at KPMG had any comment on the matter. 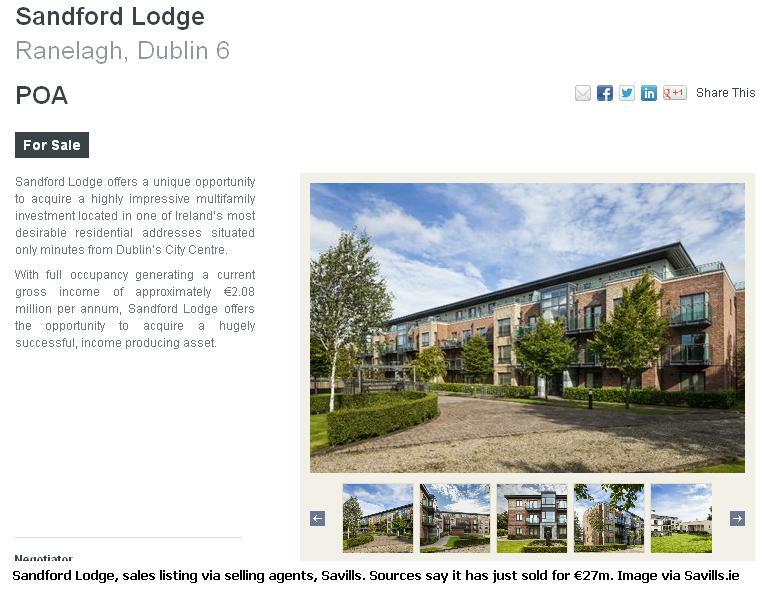 The sales listing and brochure for Sandford Lodge is available here from selling agents, Savills. Most people agree that the first Matrix film was an entertaining, and maybe a great, film. The second film was a bit “meh” and the third was unwatchable except for the most diehard fans. But as popular as the first Matrix was, and it was certainly stylish and the tone of the conversations was impressively weighty, what was actually said was a load of crap. “More important than what, is when” says Morpheus before explaining to Neo that the year is 2197 not 1997. Think about that for a second and it is utterly meaningless. Morpheus goes on to explain that their craft is a “ship, the Nebuchadnezzar. It’s a hovercraft”. No, it’s not, it’s a submersible and you never see it hovering. In fact, you might never be able to watch that film with a straight face again if you actually think about what is being said throughout, because it’s just a stylistically-rendered load of rubbish. NAMA has this morning produced a matrix . The matrix (shown above) is NAMA’s attempt to show that contrary to popular perception, NAMA is a very transparent organisation, at least relative to the State-owned banks and semi-state agencies. And on the face of it, NAMA is impressive, and as far as this matrix goes, it is accurate. In fact NAMA is a martyr to itself by omitting the fact that it has a dedicated blog to track its progress, and there isn’t an AIBshootingFishInABarrel or an IBRCcosts50pcmorethanNAMAtorun blog. Okay, NAMA doesn’t refer to the fact that it is not subject to Freedom of Information legislation, and it might be considered a tad inconvenient to remind us that it is at present fighting tooth-and-nail with the Information Commissioner in the courts to stop NAMA being subjected to environmental requests. But this is NAMA’s visual attempt to convince you it is transparent. But unlike the ESB or Bord Gais, where you can get a good sense of sales, costs and profits, NAMA’s performance is still shrouded in thick fog. If you were to ask me today how NAMA was performing, I could stick on a pair of shades and adopt Morpheus’s all-knowing tone and tell you it’s doing badly or well, but in truth we don’t really know. Is NAMA making a profit? Presently yes, by reference to accounting standards though it is carrying a €1bn cumulative loss, and remember that it imposed a separate €42bn loss on the banks. But even the current NAMA profit is skewed by accounting conventions like “effective interest rates” and the rules about when NAMA can recognise profits. We know that NAMA overpaid the banks by €5.6bn compared with what the loans were worth on the open market – that was deliberate and the EU approval of NAMA anticipated that a premium would be paid for long term economic value et cetera. And since NAMA valued those loans, property values in Ireland are down a further 25-30%. So what big hole lies beneath NAMA? NAMA won’t tell you about profit on individual sales, or what projects it is investing in or how many staff are currently suspended – “we don’t discuss individual transactions”, “we don’t discuss individual staff” – nor even confirm overall totals for staff suspended. 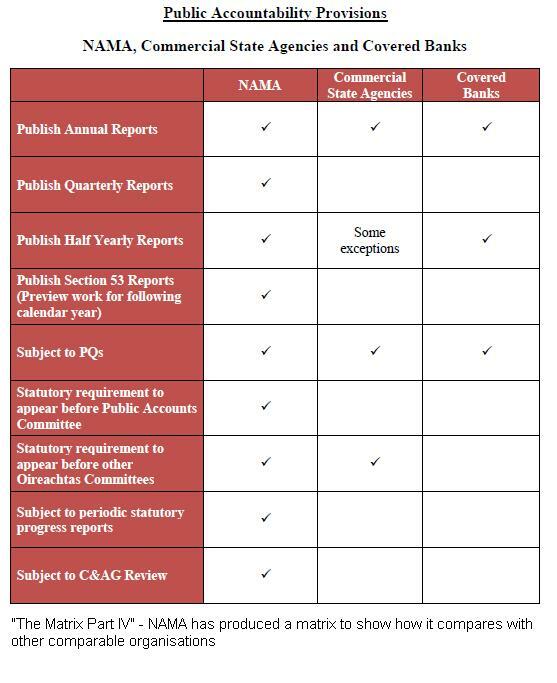 Somehow, even though the ESB and Bord Gais are less transparent than NAMA in NAMA’s matrix, we tend to feel more confident about the transparency of their operations. Opposition politicians may have largely abandoned their sallies on Minister for Health James Reilly’s position on the bumping-up of a site in Balbriggan belonging to his associate, for development as a primary care centre, but controversy and malodour involving the Minister and his actions are not going away. Today we learn of continued resistance by consultants to his late-in-the-day reform of work practices, but it was earlier this week that the Minister revealed in the Dail that practically all medicines used in the Irish public health system are expensive non-generic medicines. This compares with just 20% use of non-generic medicines in our closest neighbour, the UK. Minister Reilly was responding to a series of questions from the Sinn Fein health spokesman Caoimhghin O’Caolain and the Sinn Fein finance spokesperson Pearse Doherty. It was revealed that in 2011, a staggering total of €1.85bn of drugs were prescribed in Ireland and that just a paltry €100m per annum are non-generic. In a recent IMF report on selected issues in Ireland, it was revealed that in the UK, 80% of drugs prescribed are generic. It seems that the IMF estimate of generic drug use in Ireland of 20% was four times over the true percentage*, which just aggravates the point being made by the IMF. Generic drugs, whose patents may have expired, are less expensive than non-generic drugs, yet Ireland’s health service, overseen by Minister Reilly is aloof to tackling an area which could see hundreds of millions of euro savings per annum. Just how much longer can this minister continue in his post. Deputy Caoimhghín Ó Caoláin: To ask the Minister for Health the full drugs bill for the Health Service Executive for 2010, 2011 and to date in 2012; if he will provide a breakdown of same by scheme, by patent status and branded generic status. Deputy Pearse Doherty: To ask the Minister for Health if he will provide an estimate of the cost of drugs and medication used by the public health service in each of 2010 and 2011. Deputy Pearse Doherty: To ask the Minister for Health if he will provide an estimate of the cost of generic drugs and medication used by the public health service in 2010 and 2011. The HSE’s Performance Report indicates that expenditure up to July 2012 is approximately €1 billion . Expenditure on generic drugs is estimated to be in the region of €100 million per annum. The outstanding information sought by the Deputies is being collated and will be supplied as soon as possible. * UPDATE: 25th October, 2012. It has been pointed out that the IMF study examined volume which showed that 20% of volume was non-generic, the PQs above reveal that 5% by value is non-generic.